Will I Be Moved Off Property? This does happen when the hotel over books and needs your room to give to a paying guest. Your chances of being moved are of course the greatest during holidays. THE HOTEL DOESN’T WANT TO SEND YOU OFF SITE! Our experience is that the resort management will do everything they can to keep you there. The cost to have you at the resort is effectively ZERO. If they need to move you it means that they will have to pay another resort to put you up + they risk not getting the referral value of you recommending the resort to your friends and students. Our experience has been that we are moved from room to room much more often than being moved off property. 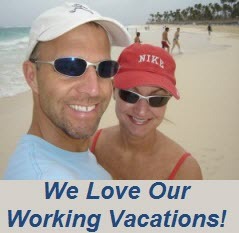 More resorts have opened and you can now reserve your week throughout dates in 2011 here.